Ply board and corrugated iron won’t stop Hurricane Irma. But guns might. The terrifying and immense Hurricane Irma is heading to Florida. Over six millions Americans have been told to pack up and leave. But Ryon Edwards, 22, is staying. And he’s going to end the storm by shooting it out of the sky. Take care, though, shooters. Aim wrong and the the bullet might not come back and kill you. 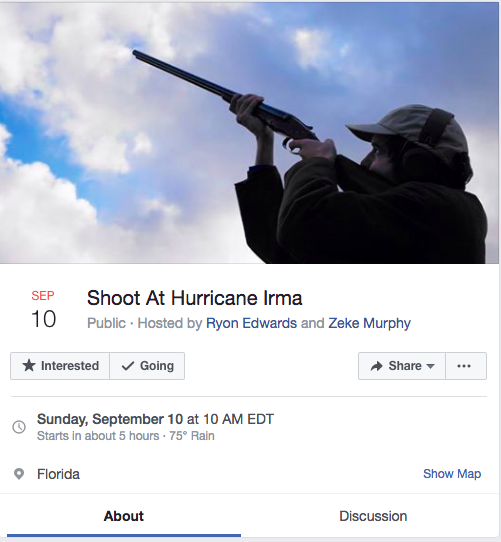 Give up, Irma. We have you surrounded.